I got my exercise today from walking and doing household chores. Also from moving around to music like usual. 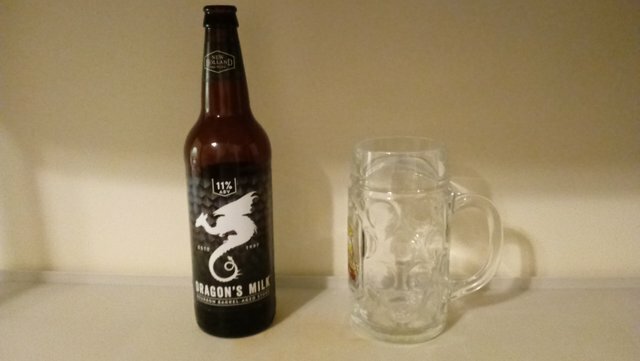 I'm drinking this beer called Dragon's Milk and it's basically beer with whiskey in it. It's 11% alcohol which is a lot more than regular beer. It's really better for sipping then drinking. I'm not a beer reviewer so I can't really describe it well, but it has a lot of complex flavor to it that you can taste if you drink it a little at a time. One bourbon one scotch one beer - George Thorogood! That's basically what Dragon's Milk is! Earlier today I saw that @dearw had battled me in @drugwars. She just sent one spy so it was more of a friendly visit than a battle. I think we should start a thing where we add some sort of dialogue to these battle posts that drug war lets us post to steem. Let's role-play a bit, shall we? Does anyone else want to do this? Got any plans for the weekend? I need to finish these damn taxes so that I can get them in the mail Monday. Then I can get back to my perpetual guess the number game. And then I'll get back to FunnyCuteCats.com. It's been a while not saying hi @kenny-crane! It's all good! Moved into my new apartment. Still doing actifit posts daily. Working on a steemit game or two. Looking forward to Summer and swimming in the pool! 😃 How are you? Hmm Seems like getting a new life environment out there! Me? I'm very well. I just back from my short vacation recently. And now I'm trying to be more active on this platform. Hope you enjoy your summertime soon my friend! Btw, May I know what's your channel on YouTube? I would like to subscribe yours! It's nice to get away on a short vacation! Here's my YouTube channel. I haven't posted anything in a long time though! Nice count, I was thinking there would be milk in the beer😀😀😀. Well done. You have accordingly been rewarded 76.25 AFIT tokens for your effort in reaching 13013 activity, as well as your user rank and report quality! You also received an 2.17% upvote via @actifit account. I think you are a responsible person within time tex pairs. Probably i will also love to have a taste of the dragon milk. Great post 👍. thanks for sharing this post..